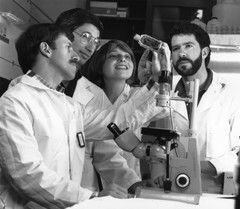 A group of scientists, 1 woman and 3 men, gather around a microscope to examine a tissue culture flask. From left to right: Drs. Bruce Troen, Robert Fleischmann, Suzannah Gal and Douglas Clark These 4 scientists were featured in NCI's "Driving Forces" video.